If you are a beginner and need more help with any of these steps, be sure to ask in the Discussion area for this class. You might also check in the library to see if the information you need is there, but be sure to ask if you need help. For this maze, you can construct the blocks first and then plan the maze. The Rail Fence block pattern is a very simple one that lends itself to quick piecing methods. Cut three strips of fabric. Sew them together, side by side. Then cut into squares. Width of strips depends on the scale of the quilt. 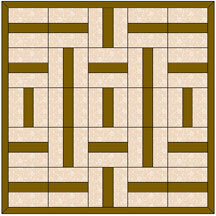 You will need at least a 5 x 5 block pattern to develop the maze, so figure the size of the quilt and the number of strips accordingly. You will need approximately 24" of background fabric and a yard of road fabric (includes binding). The strips shown as light fabric are background. Use a plain or non-directional patterned fabric. The strip shown as dark will be the "walls", so use a contrasting fabric for this. Background fabric: cut eight 2 1/2" strips. Road fabric: cut eight 2 1/2" strips (4 for the wall and 4 more for the border) plus binding strips. Sew 4 sets of 3 strips in a light-dark-light order. (They could also be made as a dark-light-dark series. See end of lesson for an example.) You can cut at least six 6 1/2" blocks from each sewn set. Construct the extra block, if needed, from the ends of the border strips and extra background fabric or make this a plain block with the child's name, etc. Designing the Maze Pin the blocks on a design wall (if possible). Place some horizontally, some vertically in random order. 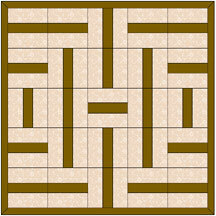 Then play with the blocks until a pattern of corridors and walls begin to emerge (the center strips become the walls). A few longer walls (two end to end blocks in the same direction) will add to the interest and design. Constructing the quilt Sew the blocks together by row, being careful to keep the pattern of direction you established (but it probably won't be too serious if you goof.) Add the border strips and finish the quilt. Note: A very thin batting or flannel makes a better play quilt. The quilting can be as simple as stitching in the ditch for a play quilt or as elaborate as the scale of your quilt will allow. Package your quilt with small cars, trucks, action figures or whatever to match the theme of your quilt and watch the excitement. If you are a beginning quilter and need assistance with finishing (attaching borders, making the quilt sandwich, etc. ), please let me know in the discussion area and we will give you all the help you need. For this quilt you are creating a graphic design. The procedure is exactly the same, but the choice of fabrics is critical. The more contrast between your fabrics, the bolder the design will be. The quickest way to plan is with a computer and a quilt program, like EQ4 or Quilt Pro, because it is so easy to see the effect of color,value, fabric and block rotation changes. But you can just go with high to medium contrasting fabrics, and the result are bound to be striking. 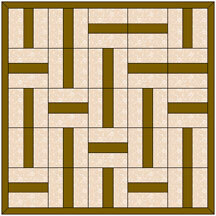 The more blocks you use in your quilt, the more intricate the design can become as in any other maze. The design can be random, symmetrical (great for two kids) or assymmetrical. If you have EQ4, you may download a zipped .pj4 file (15K) which includes blocks for lessons 2-4.